After seven years at Caversham Court Gardens, Reading Open Air returned to Reading Abbey Ruins in 2018. In 2019, we will be back performing King Lear by William Shakespeare. On this page you can find useful information for your visit. The performance begins at 7.30pm, finishing in darkness at a time to be confirmed, after 10.00pm. There is an interval of twenty minutes. A licensed bar will be open before the show and during the interval. In the case of rain, a shortened version may be presented. The Abbey Ruins will have theatre-style allocated seating; it is not necessary to bring anything to sit on. Access is from Chestnut Walk, over the footbridge and across the street if coming from Queens Road Car Park. If coming from the station, cross the Forbury Gardens, walk under the arch of the Abbey Gateway and turn left at the boittom of Abbey St. There will be no access from Forbury Gardens or Abbots Walk. Waterproofs – There's no roof, so there's just a chance there's a passing shower - not that that would ever happen in England of all places! - make sure you check the weather forecast and ensure you've got something to keep yourself dry if needed. Except in the back row, umbrellas are only allowed on your lap during the performances, so something with a hood would be perfect! Folding chairs or anything to sit on - seating is included. Alcohol - there is a licenced bar on site. Bulky items that won't fit on your lap or under your seat. so as not to disturb nearby residents. Follow signs to Reading Town Centre or Reading Station. On-street parking close to the Abbey Quarters is metered and very limited, so we recommend using the public carparks at Queens Road (the closest), The Oracle or Garrard Street (near the station). It will then be a short walk to Reading Abbey Ruins. Take any train to Reading. Exit the station on the town side, not the Caversham side. Turn right along Forbury Road as you exit the station. 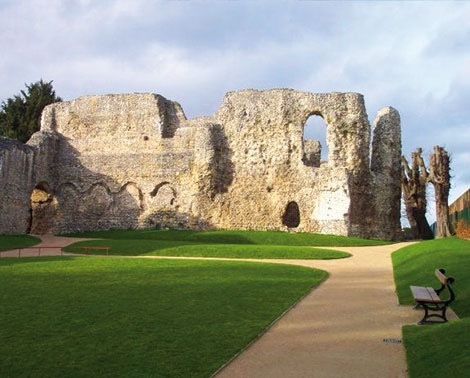 The Abbey Ruins is a five-minute walk from the station, accessed via The Forbury Gardens. Take any bus to the town centre - the nearest stops are Reading Library on Kings Road, Blagrave Street, Market Place and Reading Station on Forbury Road. For more information, please visit the Reading Buses website. When you book tickets you can book a pre-show dinner with Forbury's Restaurant. 2 Course £17.95 (£5.50 extra for dessert) / 3 course £21.95 (including dessert), excluding booking fee and service charge.Download menu. Approach from Kings Road and take the turning opposite Zizzi’s Restaurant into Abbey Street. Follow the road around to the left until you see Soane Point, then turn right. Forbury’s car park is under Davidson House.